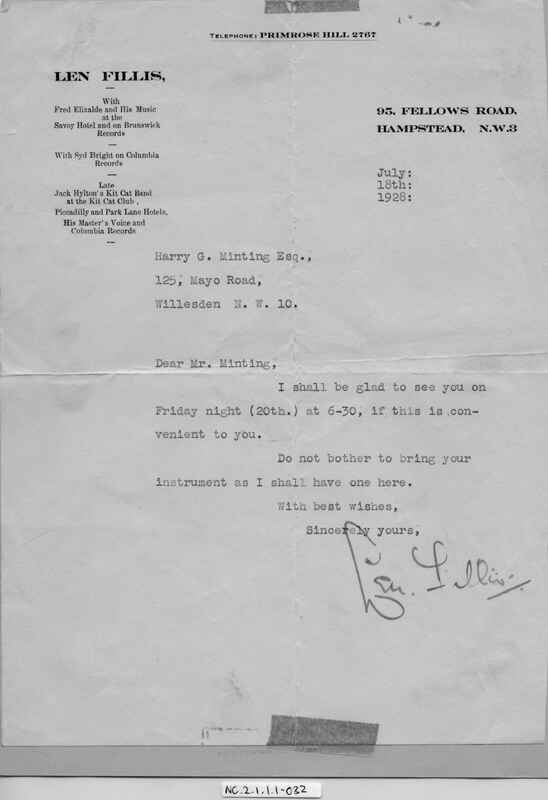 Full Description: A letter from band musician and recording artist Len Fillis dated 18th July 1928, inviting Harry to play at his house, possibly for more lessons. Harry Minting played his Vega banjo for the Shakespeare-Rutterford Band from March 1924, and later appeared in the "Voice of Vega" magazine of noted players (see Items NC.2.1.1.1-036 a, b etc). For further images and programmes of the various formats of this band, see NC.2.1.1.1-024 , -25, -26, -31, -37, -and -38.